Gli articoli di Allen Frances, interessanti come testimonianza del clima in cui vive la psichiatria americana, ovviamente non vanno presi per oro colato ,ma vanno letti in senso critico. La discussione potrebbe vertere su cosa si debba intendere per prevenzione che non credo si possa ridurre ad uno screening diagnostico di tipo descrittivo. L’eliminazione del DSMIV e V potrebbe essere una misura preventiva importante perché costringerebbe a sviluppare strategie diagnostiche più adeguate. Non è vero quello che dice Allen Frances in un altro suo articolo che la pericolosità dei Mass Murderers non può essere prevista. Non può essere prevista con il DSM ma forse se noi ricorriamo ad una valutazione psicopatologica potremmo essere in grado di individuare dei soggetti a rischio. In un contesto socio culturale in cui non esiste una possibilità diagnostica per malattie gravi ma latenti come la schizofrenia i comportamenti psicotici prendono delle strade strane e si amplificano anche per l’effetto di fenomeni imitativi come testimonia l’epidemia di mass shooting negli States che si può seguire nei suoi allarmanti risvolti nei media anche in questi giorni. Preventive psychiatry may someday be of significant service in reducing the burden of human suffering — but only if it can be done really well. And the sad truth is that we don’t yet have the necessary tools. More people will be harmed than helped if psychiatry stretches itself prematurely to do what is currently well beyond its reach. That’s what is so scary about the unrealistic prevention ambitions of DSM-5, the new manual of mental disorders now in preparation and set to become official in 2013. DSM-5 proposes a radical redefinition of the boundaries of psychiatry, giving it the impossible role of identifying and treating mental disorders in their nascent stages before they have fully declared themselves. Tens of millions of people now deemed normal would suddenly be relabeled mentally disordered and subjected to stigma and considerable risks consequent to inappropriate treatment. The model fueling the premature DSM-5 hopes for preventive psychiatry has been borrowed from general medicine. In recent decades, the threshold for defining illness has been progressively lowered. Medication is now given for blood pressures or blood sugars, for cholesterols or for levels of bone density that were previously considered well within normal limits. Preventive tests for breast and prostate cancer have been used widely for early detection leading to proactive surgical interventions. It is ironic that psychiatry wants to jump on this bandwagon just when some of its seeming promise is fading — many previously-ballyhooed preventive medical and surgical procedures are losing their luster. As good as early intervention sounds in theory, in practice the gains afforded by preventive medication often don’t compensate for side effects. And preventive testing may result in more complications than benefits. The once highly-recommended routine testing for early prostate cancer has been abandoned because it is useless in saving lives and promotes unnecessarily-invasive treatments. And routine mammogram testing is now being restricted to a much narrower age range and offered at much less frequent intervals. If the blush is somewhat off preventive medicine, how much more caution is warranted in psychiatry, where the preventive efforts are much less feasible and the possible harm often greater? All this said, there is no denying the seductive appeal and optimism generated by the prevention model. The storyline is that we can and should identify people destined to have mental disorders early in their course — before symptoms can cause grave distress or impairment. Then, we can intervene early with effective measures that may completely prevent the later development of their symptoms or at least reduce the total lifetime burden of illness. Once people actually get clearly sick, so the argument goes, their brains may be further damaged by the illness, their lives ruined by the secondary effects of having symptoms, and treatments may become less effective. So the secret is to strike before the iron is hot. Preventing symptoms early sounds a lot easier and more efficient than curing them later. DSM-5 has suggested a number of new disorders intended to initiate the brave new world of early identification and preventive psychiatry. Psychosis risk is the putative prodrome of schizophrenia, minor neurocognitive is the prelude of dementia,and mixed anxiety/depression presages more clearly defined mood and anxiety disorders. DSM-5 would also dramatically reduce the thresholds of existing disorders, turning just two weeks of grief into major depression, normal distractability into attention deficit and the worries of every life into generalized anxiety disorder. It simply won’t work, in my opinion. Three unavoidable preconditions must all be met before it will make any sense to so dramatically lower diagnostic thresholds in the service of preventive psychiatry. None of these can remotely be achieved, now or for the foreseeable future. First, the patients identified as prodromal must be at considerable risk of actually going on to develop the full-blown disorder. Predicting this precisely enough is currently completely impossible. For every new true “patient” identified correctly as really being at risk, there will be very many who will not progress and would do just fine if instead left to their own devices. Secondly, the preventive interventions must be effective. This has not been documented for any of the DSM 5 candidates. Antipsychotics given before disease onset don’t prevent schizophrenia, cholinesterase inhibitors don’t prevent dementia and time and placebo effect are by themselves so effective in curing many milder conditions that nothing else is necessary. Finally, the prevention must be safe — clearly not the case when most of the currently available real world interventions will consist of medications that have appreciable side effects and risky complications. The risk/benefit ratio for treating the traditional and clearcut psychiatric disorders is extremely favorable. Most patients experience appreciable benefit and some are totally cured — so the risks that accompany any effective treatment are well worth taking. And once a psychiatric disorder does clearly declare itself, every effort should be made to treat it promptly, thoroughly and for however long it takes. The longer a disorder is allowed to fester or linger, the more impairing it is and more difficult to treat. But the risk/benefit ratio for the preventive treatment of the proposed pseudo-patients defined by the new DSM-5 proposals tilts badly in the opposite direction — the risks remain just as high and are certainly not worth taking because the benefits are so minimal. The way things add up now is therefore crystal clear. All the possible benefits of preventive psychiatry are unproven and theoretical and off somewhere in the distant future. In contrast, the grave risks are already with us — children are currently getting way too much harmful medication given carelessly for very questionable indications. And the risk/benefit ratio looks even worse when we consider who will be doing most of the preventive treatment of the new conditions suggested in DSM-5. Recent CDC statistics show that the overwhelming majority of prescriptions for psychiatric drugs are not written by psychiatrists and that most people taking psychotropic medication are never seen by any mental health professional. So although it would be psychiatry introducing the new DSM-5 diagnoses to be used in preventive psychiatry, it will be non-psychiatric physicians who will be assessing most of the patients and providing most of the treatment. Their decisions usually follow 7-minute visits and often reflect only limited training in psychiatric diagnosis and a casual acquaintance with the proper use of psychiatric medicine. Preventive psychiatry is a bad idea in the best of hands, it can be a menace in the worst — an additional excuse for furthering the current practice of wanton overmedication. Will preventive treatment at least be unsullied by crass commercial interests? Hell no. I know the people preparing DSM-5 and have complete confidence in their sincerity — they are suggesting what I consider to be dangerous changes in the diagnostic system, but for the best intentioned reasons having nothing to do with shilling for drug companies. But the purity of their intentions won’t stop Big Pharma from licking its chops and aggressively exploiting the vast new markets opened by DSM-5. There are always many more potential customers with very mild illness (or no illness at all, suffering from just plain human unhappiness) than there are people with clearcut psychiatric disorders. My last piece warned that our country is already plagued by loose overdiagnosis and careless overtreatment. This has been tirelessly driven by ubiquitous drug company marketing — peddling psychiatric ills in order to help sell their overly-hyped and overpriced pills. Everyday distress transformed into mental disorder is a marketing dream come true. What is the bottom line? While preventive psychiatry may eventually be the next great advance in our field, it is at least a decade away (and perhaps several decades). We will first need to develop accurate biological tests that require a much deeper understanding of mental disorder than is currently possible and also preventive treatments that are effective and safe. Because the premature new diagnoses introduced by DSM-5 would all cause more harm than good, they should be dropped before the manual becomes official. Preventive psychiatry is the wave of the future, but would be the bane of the present. 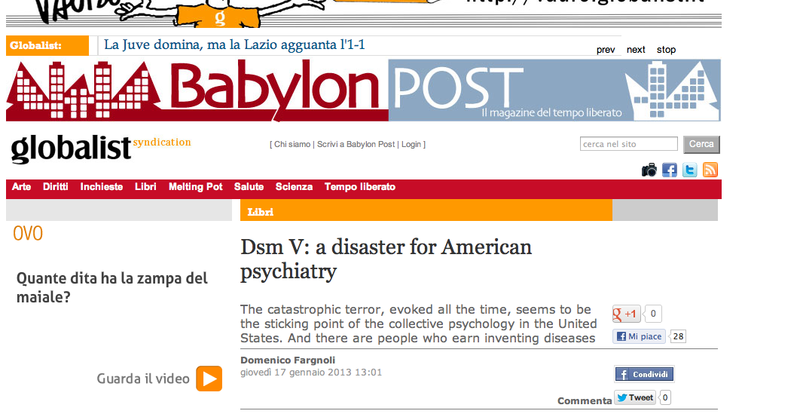 Allen J. Frances, Professor Emeritus of Psychiatry at the Duke University and coordinator of the team of experts that in 1994 created the DSM IV (Diagnostic and Statistical Manual of Mental Disorders), regarding the soon to be published new version, the 5th, talked about “a disaster”. With respect to its etymology, the term “disaster” (dis-aster) refers to a calamity, as it could have been the end of the world proposed by the Maya, caused by negative astral influence. The DSM manual, now considered in its various editions a true Bible for psychiatry, has been conceived and written by real people, with real names: on those real people must fall the enormous responsibility for the incalculable damages that the practical applications of DSM criteria – completely devoid of any scientific basis – could cause to the mental health of millions or even billions of people. To exorcize or cancel the sense of guilt about the possible iatrogenic damage, I think that it’s not enough to simply exchange a human event with a natural event, just as schizophrenic patients use to do; or to lose the research of the real causes by referring to horoscopes, destiny and alignment of planets. As the use of particular terms reveals, a catastrophic sense has silently and unnoticeably entered, just like the Trojan Horse, the secret citadels of the powerful lobbies of the A.P.A., pointing out a dangerous flaw in their ideological pseudo-truths. The subject is very present. Freus’d “death” has left, in America, a heavy heritage that negatively influenced psychiatry. Catastrophic fantasies and daydreaming form part of the connective tissue of North American imagination: from the famous 1938 radio show in which Orson Welles announced the war of the worlds and the Earth attacked by Martians, causing a wave of uncontrolled and general panic; to cinema productions like “The Invasion of the Body Snatchers” (Don Siegel, 1956), or like more recent ones: “The Day After Tomorrow” (Roland Emmerich, 2004), “2012” (Roland Emmerich, 2009), the catastrophic terror, perennially evoked and exorcised, seems to be the sensible, aching spot of collective American psychology. Surely Osama Bin Laden had well understood this aspect, when planning the attack to the Twin Towers: a scene that, seen on television, seemed to be taken from a Sci-Fi movie. Sometimes nightmares, or what psychiatrists could define as “socially shared deliriums” are transformed by someone in reality with an enormous amplification of the terrifying effect. In May 2013 the new edition, revised and corrected, of the DSM, the famous Diagnostic and Statistic Manual of Mental Disorders will be published: even without referring to astrology, it’s been anticipated that for American psychiatry it will represent a true announced catastrophe. According to Allen J. Frances, the present moment – that exactly matches the final approval and the imminent release of the manual – is the worst moment in his multi-decennial activity of study, teaching and clinical research in psychiatry: he encourages patients, physicians, media and naturally psychiatrists to refuse credit to a publication that, in his opinion, has no scientific credibility and that could lead to many and very serious diagnostic mistakes, extremely dangerous for patients due to completely useless prescriptions for drugs. These new diagnoses in psychiatry could well be more dangerous than the medicines, because they deeply affect the circumstance that millions of people could be prescribed psychotropic drugs often by general practitioners and after a very short interview. The introduction of new diagnoses should be done with the same attention that is dedicated to the patients’ health when introducing on the market new drugs. All the new diagnostic categories introduced in the DSMV – from those regarding alimentary abuse (basically everyone who loves eating and good food could be diagnosed with Binge Eating Disorder), to addictions (millions of youths could be diagnosed with Internet Use Gaming Disorder), to autism spectrum (Autism Spectrum Disorder, in which from now on will be included the Asperger Syndrome, that used to be a separate and autonomous diagnosis) – extend the limits of pathology by the tendency to codify many symptoms that are dangerously close to “normality”. There are many other extremely controversial aspects in the DSMV, like the adoption of the definition “Pedophilic Disorder”. The word “disorder” can not, in any case, give a correct idea of the seriousness of this pathology, that in this new edition is considered in such a manner only when the sexual fantasies and impulses create a sense of clinically significant “discomfort” (sic!) or the impairment of working or social activity, as it was already stated in the DSMIV. This definition has a very important consequence: only those who perceive a sense of “discomfort”, a sense of guilt, that is, could be diagnosed as pedophiles, while those with a much more serious illness, those that are completely unemotional could be considered normal because they do not feel any guilt or discomfort, because they maintain an equilibrium. This tendency to identify “normal” and “unemotional” can be found also in the decision – that could also appear in the DSMV, unless last minute changes are adopted – of confusing the pain caused by the loss of someone close, with a clinical depression. Grief excluded depression in the DSMIV, while in the new edition these two situation could coincide. Regardless of the final conclusion of this controversy, that has risen due to many protests from many columnists and important scientific publications, it clearly speaks well about the ideological foundation of American psychiatrists, that consider schizoids, those that are completely unemotional, as perfectly normal and balanced people. The repercussions of this conception are important: every year 2,5 millions of people in the United Stated die, leaving many more people, relatives and friends, in a state of sorrow and grief; if this condition goes on for more than two weeks, these people could easily be diagnosed, especially by general practitioners, a depression – this with great satisfaction, economical also, for pharmaceutical industries. In everyday’s medical practice the false positives of depression diagnoses after a loss, cause absurd situations and clearly show, just by common sense, an admission of complete incompetence. American psychiatry is absolutely unable to face extremely serious psychotic situations such as Adam Lanza’s mass murdering: in this case schizophrenia hasn’t been diagnosed and aptly treated. A normal and physiological state of grief is considered pathologic and a clear psychotic state isn’t detected. The so called “mass shooting” has become almost epidemic, a sort of unconsciously repeated dramatization of the idea of a violent and hyper rational society (62.000 deaths in just a few years by firearms) that historically has been erected on racism and systematic extermination of native populations. The same war ideology that makes the United States so present in many unfair and useless conflicts, is the origin of a psychiatric emergency in the armed forces: 295 soldiers took their lives just in 2012. The only given response to this dramatic situation is a manual that’s been created with the aim of reinforcing the academic status quo, that is very far from real life and whose main interest is to obtain an economic profit for pharmaceutical sector. 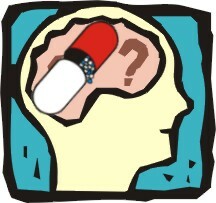 According to Frances the motivations that lead to the new edition of the DSM aren’t just of economic nature, tied to a very simple conflict of interests among various researchers paid by different pharmaceutical industries; this conflict, for the scientist, is a lot more of “intellectual” nature: these highly specialized researchers have the natural tendency to value their personal guidelines and ideas, to expand their sectors of study regardless of the practical clinical consequences for the unfortunate patients. It must not be underestimated that A.P.A. invested 25 millions in DSMV, and given that the previous edition has been a worldwide bestseller, a similar result is expected for this new edition as well, not only in terms of profits from the sells, but also in terms of increased popularity and prestige for the researchers – popularity and prestige that can be cashed in on as well. Even if Professor Frances’ critiques appear to be somehow well motivated, they do not decrease his personal responsibility in this announced disaster. He has been, indeed, the first creator of DSMIV, starting what now appears to be a true psychiatric apocalypse: it must be remembered that the 1994 edition of the manual was labeled as “trash science” in an international survey of experts carried on in England in 2001, as well as being voted as one of the ten worse psychiatric publications of the millennium. It’s false, therefore, to say that there’s a substantial difference between DSMIII and IV, because in the latter, already, it was introduced a clear loss of effectiveness of the diagnosis in favor of its reliability: a group of psychiatrists finds an agreement on a series of atypical behaviours and on the fact that they found a mental disease. The creation of new categories becomes, therefore, a sort of cultural and intellectual game completely devoid of any scientific validity despite its – supposed – reliability that comes from the simple fact of being shared by a large number of experts: this procedure, applied to the real world of clinical practice is a fraud tout court. As it shows, not only Allen J. Frances appears be to be unreliable when not only declaring his non-theoreticism, but also when claiming to have overcome the confusion of diagnoses that ruled psychiatry before the DSMIV; a confusion largely due to the massive presence of Freudian psychoanalysis in America. There’s a precise historical and ideological continuity between the Freudian fraud – submitting patients to analysis without wanting and without being able to be a cure – and DSM in its various versions – proposing diagnostic criteria based on pseudo-scientific assumptions, as those regarding the affirmed genetic nature of schizophrenia, just as an example, very useful to be paid by medical insurances. Just as Freudians considered all human beings as potential carriers of mental illness, for the fact that in everyone there would be a naturally perverse subconscious and a schizophrenic ideation as the one in dreams; so the A.P.A. now with DSMV sees in normality a state of potential illness: for the psychoanalysis, mental illness, omnipresent in every human being, was latent in the subconscious; at present moment, on the other hand, mental illness is found in the conscious and in the behaviour of so-called normal people that, for example, have the misfortune of losing a relative, therefore getting trapped in the knots of the diagnostic categories of DSM. Personally I will comply with Allen J. Frances advices: I will boycott in every possible way the DSMV, adding that I’ve done exactly the same with III and IV. 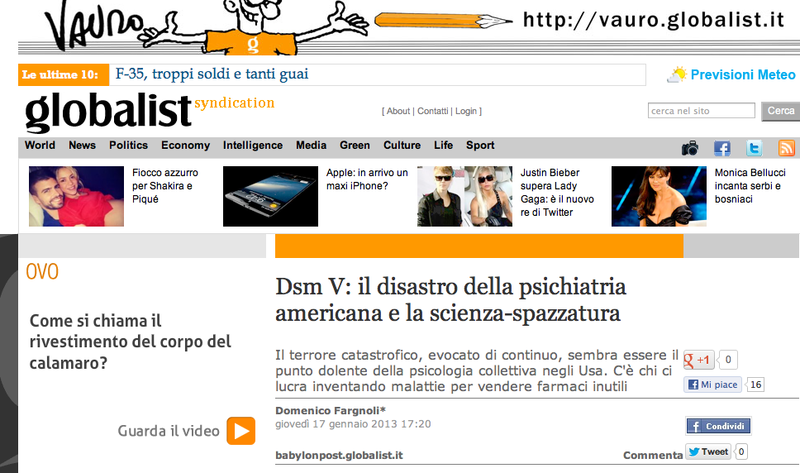 Just as I did not believe to Mayas’ prophecy about the end of the world, so I don’t believe that the failure of DSMV is a particularly meaningful event in the history of contemporary psychiatry, despite all the hype in the mass media. According to my experience and formation, the true game regarding the future of psychiatry is played on another field: in my professional practice I will keep on using the classification of illnesses that was already present from the start of 20th century in the great theoretical production of the psychopathologists, with the likes of Jaspers, Eugen Bleuler, Minkowsky, Kurt Schneider, Barison. To my advice, only the critical revision of those diagnostic categories with a psychopathologic derivation, carried on for more than sixty years by Massimo Fagioli, allows us to correctly identify and focus the nature of the pathogenetic processes that we have to face in the practice of psychotherapy. Fagioli’s “Teoria della Nascita” (“Birth Theory”) completely transformed all traditional theoretical views regarding the genesis of mental illness. Starting with Esquirol, throughout 19th and 20th centuries to the present (the last example being Rita Levi Montalcini), it’s been thought that mental illness is tied to a rationality deficit and to a diminished ability to draw together by the conscience. Regression, therefore, would set the subconscious automatisms free, taking into light an irrational ideation that was considered naturally psychotic. Today, though, we know that the generating nucleus of the illness does not reside in conscience, but in a specific unconscious activity, the “Pulsione di Annullamento” (“Annulment Drive”), that was historically discovered by Fagioli: the “Pulsione di Annullamento” is not a natural characteristic with which each human being was born; to the contrary, it derives from a failure in the relations with other human beings. Originally the “Pulsione di Annullamento” comes from an inadequacy in the relation between mother and child: this inadequacy – no matter how we conceive it – affects the child’s vitality right from birth. Only by identifying the generating nucleus responsible for the specific form that mental illness takes, we can get also what is not immediately visible and understandable by the conscience, thus formulating diagnoses that are not only reliable, but also motivated and true. Many other internationally known researchers, such as American Louis A. Sass and Joseph Parnas from Copenhagen University, share this same view, although in a different theoretical reference frame; according to Parnas, only by improving our psychopathologic knowledge, we can fight the reification of the diagnostic categories that is carried on in the various editions of the DSM, the Bible of American psychiatry.